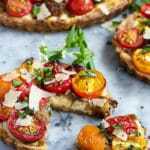 This savory cheese tart is made with three kinds of cheese, fresh baby tomatoes, caramelized shallots and an easy herb and cheddar pastry crust. An excellent tart to share with friends! It can be made as a larger tart or smaller individual tarts. In a stand mixer or in a food processor, add the flour, salt, baking powder, herbs and shredded cheddar cheese. Then add the cold butter. Pulse in your mixer till it resembles small peas. You can also do this by hand with a pastry cutter. It just takes a little more work. Then add the cold liquid slowly and mix till just combined. Pour out on to a surface and mold the pastry into a ball. Wrap it in plastic wrap and place in the fridge for at least 1/2 an hour. 1 hour is better. After an hour, roll out the pie crust so that it fits your tart pans. Drape the pastry over your tart pans and gently push the pastry into the corners and the bottom of the pans. Roll your rolling pin over the edges of your tart pan to cut off the extra pastry and make a perfect fit. Put your pastry in the fridge for 30 mins before baking so it gets nice and cold again. When you are ready to bake them, place a piece of parchment paper over the pastry and fill each tart with pie weights. You can also use dried beans for this too! The weights make sure the shells will keep their shape when they bake. Bake the tart shells at 350 for about 10-12 mins for smaller tarts and 13 - 15 mins for larger tarts. Keep an eye on them though. You don't want them getting too brown, especially on the edges. Its ok if the shells aren't fully cooked. They are going to bake in the oven again. While the tart shells are getting cold in the fridge or baking in the over, get your filling ready. Get out a small skillet and heat it to med - low heat. Add the sliced shallots and butter to the pan and cook, stirring every once in a while until they get nice and soft and browned. Then let them cool. Add the boursin cheese to a bowl and grate the zest of the lemon onto the boursin. Then give it a good mix. A micro planer like this is the best for grating citrus zest. Wash and slice your baby tomatoes in half. Into the baked tart shells add the filling. First spread the boursin mixture on the bottom of the shell. You need just a thin layer but make sure the bottom is covered completely. Maybe a 1/4 inch thick. Next spread the shallots on top. You can put as many or as little as you like, but make sure you have enough for all the tarts. Cover the shallots with shredded cheddar cheese. Just a thin layer again. Place the baby tomato halves on top of the cheddar cheese in a single layer. Sprinkle with fresh thyme and maldon salt. Heat your oven to 400 degrees and bake your tarts for 25 - 30 mins. If the edges of the tart shells get too browned, put a piece of parchment paper or tin foil on top of the tarts and that will help prevent them from burning. When they come out of the oven, sprinkle with shaved parmesan cheese and chopped basil. Let the finished tarts cool slightly and then eat them! This recipe will make 2 large 8 - 9 inch tarts, or 6 - 8 small 3-4 inch tarts. The nutrition information is approximate and is for 1/10th of this recipe.